Rhubarb (Rheum rhaponticum): growing, planting, caring. A useful plant for your garden that'll be by your side for years to your pie-making and canning delight. Rhubarb is a big rhizomatous perennial that only has an edible stem! The leaves and the flowers are toxic, so be careful. It'll be happy in rich, cool soil that's rather acidic or neutral, in the sunlight or partial sunlight. The harvest takes place from April to September. There are a number of varieties that are purely ornamental. Rhubarb is a perennial from the Polygonaceae family, with enormous leaves and flattened upper stems. The petioles have a very acidic taste. The flowers are small and bunched, located on large, hollow stems of a meter and a half in length. Plant in autumn or at the beginning of spring in rich, cool, and mostly acidic soil (adding organic material may help acidify your soil if there isn't too much clay...), in full sun or partial shade. Tamp down well around the roots, then water. Be careful, if planted in full sun, rhubard gets very thirsty during the summer! Water for the first month if you planted in the spring, and in case of extreme heat. 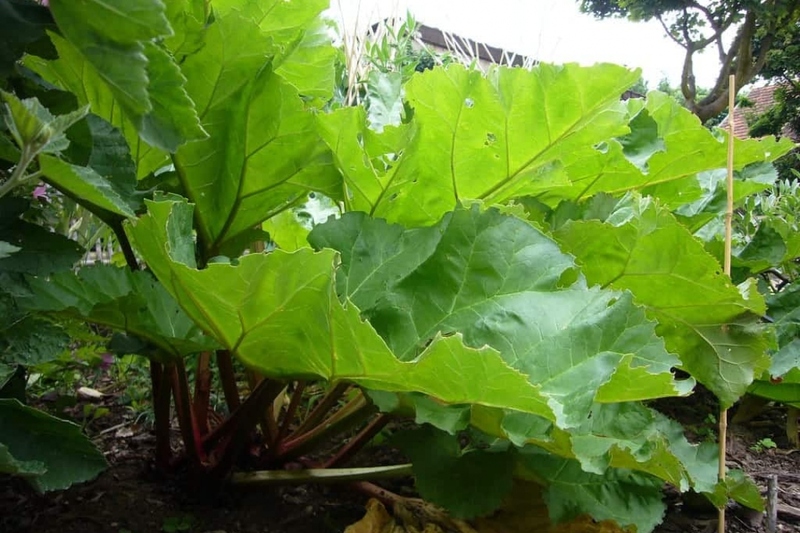 It's said that rhubarb "sweats" in the summer, due to it's huge leaves! Therefore, it demands specific watering. You can propagate the main tufts in March with a garden spade. Mulch in March with well-decomposed, organic compost! Harvest rhubarb stalks from April to September, use a knife to remove them properly from the plant. Don't eat the flowers or the leaves, both are toxic. Don't harvest the entire plant, leave it enough energy to get through the winter. Between November and March, spread a layer of compost at the base of your rhubarb to help it grow.